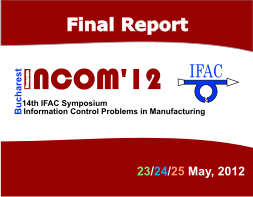 The papers included in Preprints and presented at INCOM'2012 are now published in the post-symposium Proceedings Volumes by Elsevier Ltd on IFAC-PapersOnLine.net, with an ISBN for the Proceedings and a DOI for each paper. These papers can be downloaded by a large scientific community and are indexed by Scopus database. 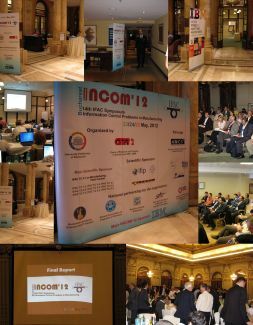 Several Special Issues have been proposed by leading International Journals for INCOM’2012. These Special Issues publish extended versions of INCOM'12 papers, selected by Guest Editors after an additional peer review process. All papers published in the Symposium Proceedings Volumes, including those presented during poster sessions, are being evaluated. Please find below the list of Special Issues currently under review (with the Guest Editors and Tracks/Sessions concerned) as well as the Guidelines for the reviewing procedure. 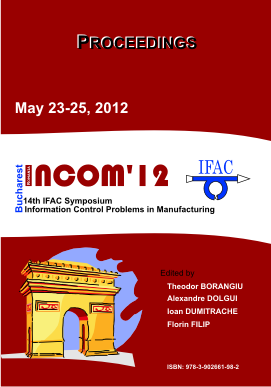 Finally, please note that the papers presented at INCOM'2012 will be also screened by other journals associated with the symposium for possible publication in regular issues. One of INCOM's major objectives is to spotlight the related scientific research in the most widely recognized scientific journals. The INCOM'12 track organizers are currently proposing call for publication of presented papers in international journals or evaluating track papers to be directly propsed for special journal issues or selected papers submision. Please follow the information we will periodically update in this website section.